As the 2018 World Cup frenzy starts to take over the news cycle, it is essential that we highlight examples of how the sport has brought people together, such as is the case of Celtic FC and Palestine. Celtic Football Club, a football club based in Glasgow, Scotland, has consistently shown solidarity with the Palestinian struggle. The question asked by many isn’t whether or not the Palestinian cause is worthy of being supported, it is, but why Celtic FC and its fans have so consistently pledged their support to it while many others haven’t. Many fans of the football club, say they sympathize with Palestine’s struggle because they see similarities between its fight against Israeli colonialism and imperialism and Ireland’s struggle against British colonialism, imperialism, and subjugation. While the issues faced by the Irish should be seen in there own unique context they do bear some similarities to those faced by Palestinians. It is essential to state this article doesn’t seek to call both struggles equal, because they aren’t, it is, however, meant to analyze the similarities of the two conflicts and highlight the solidarity created across borders through the sport of football. The Irish Diaspora, from the 1700s to present day, numbers in the tens of millions. Although many moved to escape famines and to embrace new seemingly more bountiful lands, millions also fled due to land displacement or subjugation under the British Empire. The Palestinian Diaspora, starting with the event of the Nakba (meaning ‘The Catastrophe’ in Arabic) have faced a similar struggle since the creation of the Israeli State in 1948. At that time, over 700,000 Palestinian Arabs were displaced from their homeland, a number, which has now ballooned to over 12 million. The United Kingdom and Israel have primarily caused these displacements, by policies implemented throughout their colonial projects, routinely passing laws, which sought to force second-class citizenship on to Irish Catholics and Palestinians Arabs, forced displacements and presided over the military occupation of the lands of both peoples. They have also justified their murder and subjected both groups to oppressive and inhumane conditions. During the 30-year conflict in Northern Ireland known as The Troubles, British troops were commonly known to call Northern Ireland the British Army’s ‘best training ground.’ Similarly, the Israeli Army has used the Palestinian people and its lands as a ‘testing ground’ for arms supplied by U.S., U.K., and other suppliers. As someone, who has done human rights work in both Northern Ireland and Palestine, the parallels between the two struggles go much deeper than just the towering walls that separate the two communities in both regions of the world. The United Kingdom has defended these laws, claiming that they were necessary to deal with the threat of the Irish Republican Army and the Provisional Irish Republican Army. This use of internment without trial was eventually phased out after 1975, but between 1971 to 1975, 2,000 people were held in British jails without trial, 90 percent being Irish republicans. Israel has also been notorious for using administrative detention to hold Palestinians in custody indefinitely, without ever taking them to trial. As of April 2018, 424 Palestinians – including two women and three minors – were held in administrative detention in Israel. Israel currently holds 315 Palestinian minors in Israeli prisons, and over 25 children have been in administrative detention since October 2015, a clear violation of international human rights law with the implementation of the United Nations Convention on the Rights of the Child (CRC) signed in 1991. Celtic FC & PalestineCeltic Football Club was founded in Glasgow, Scotland in 1887 by Brother Walfrid, with the intent of helping the poor immigrant Irish population who had fled to Scotland after being displaced from their lands to flee from the hunger enveloping their land back home. Glasgow and Scotland at that time were primarily Protestant and treated the Irish Catholics as second-class citizens and with open prejudice and hostility. Celtic FC became a symbol of the Irish struggle against British Imperialism but also became a shining light that the migrant Irish community could rally behind and a place where its members could come together. Support for the Irish struggle has had strong ties with Celtic FC throughout the years with fans singing songs supporting Irish Republicanism and the Irish Republican Army during games, especially if it was against their arch-rival club, Rangers FC. 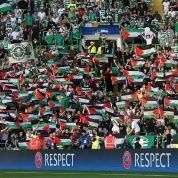 For a lot of Celtic FC fans, their show of support and solidarity with Palestine is a way of showing solidarity with the dispossessed and oppressed, something that they have been familiar with in their struggle. However, their solidarity goes much further than just waving Palestinian flags; they have consistently used their platform to speak out against the abuses and killings of Palestinians by Israelis and have raised over £130,000 for Palestinian charities. Celtic FC fans, many who self-identify as anti-racist and anti-fascist, are no strangers to showing support to oppressed people who fight for their land and the dignity to have fundamental human rights, as they also have at times showed support with the South African struggle against apartheid, solidarity with the Basque people for their independence from Spain, and have been known for raising money for Syrianrefugees and welcoming them into their community. The Celtic FC crest was projected onto a building last night in Ramallah, occupied Palestine. Celtic FC fans know that their displays of solidarity are a way of showing the Palestinian people that they have not been forgotten, and to show them that there are millions of people in this world who are not afraid to stand up and show the world that they are with them. International solidarity, now more than ever, is greatly needed in this world, as a way of all the dispossessed and oppressed people to finally come together and tear down this terrible system. Maybe, just maybe, Celtic FC fans have shown the rest of us the way forward.